The higher brightness is achieved by Illuminating the park lamp fillament, inside the Brake lamp bulb, whenever the Brakes are applied. This modifiaction has the benefit of not only increasing the brightness of the Brake lights during daytime (making the brake lamps more visable from the glare of the sun), But will also Illuminate the Brake Lamp at a lower brightness, even if the Brake Fillament has blown. This modification takes about 10 Minutes to complete, and costs approximately $1.00 to carry out. A diode prohibits current flowing in both directions in an electronic circuit. 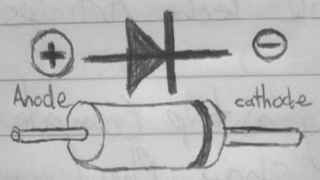 When a diode is placed in a circuit, power can only travel from the (Anode) positive side of the Diode, to the (Cathode) negative side of the diode. The Cathode side of a Diode is designated by a stripe or band, close to the metal leg. A typical example of the use of a diode in an automotive application is in factory fitted spot lamps. A diode is used to allow the spot lamps to Illuminate when the High beam lights are operating, but will prevent the High Beam lamps from operating when the spot lamps are used. It does this by only allowing power to flow FROM the High Beam circuit, to the Spot lamps Circuit, but NOT FROM the Spot Lamp Circuit, to the High Beam Circuit. I.E. 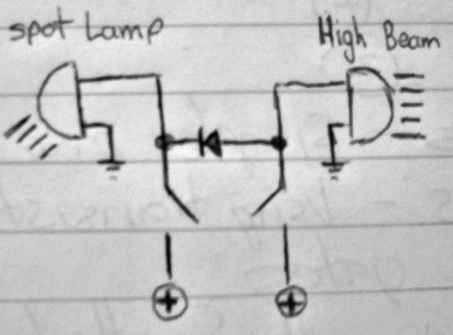 The Diode is used to connect the two seperate circuits, allowing power to flow only from the High Beam Circuit, to the Spot Lamp Circuit. You will require 2 x 1N4004 Diodes, for each brake lamp to be converted. You will also require a soldering iron, solder, electrical tape, and a short length of 5 amp wire. 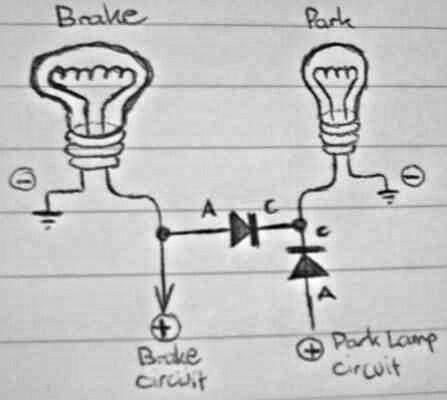 The first diode connects the Brake Lamp Circuit, to the Park Lamp Circuit, allowing the Park Lamp Fillament, in the Brake Bulb to illuminate when the Brake lamps Illuminate. The Second diode, placed along the Park Lamp line, prevents the power from the brake circuit from flowing back down the Park lamp Line, and Illuminating the Dash lights, and front park lamps, when the brakes are pressed.